The Dow Jones today traded 170 points higher in pre-market hours, as investors took stock of Monday's brutal sell-off. The Dow fell 458 points to start the second quarter as investors grow more concerned about a potential trade war between the United States and China. The Dow is now trading down over 4% for the year. "Trade war" remains the talk of Wall Street as markets attempt to rebound on Tuesday morning. Over the weekend, China announced it would slap tariffs on 128 U.S. products in retaliation against recent tariffs from the Trump administration. 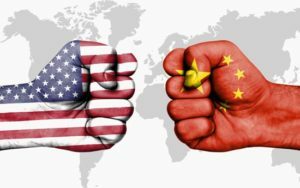 As we explained on Monday, this trade war could be the start of a major economic event that is 10 years in the making. It's time for investors to read this warning and prepare themselves. Shares of Tesla Inc. (Nasdaq: TSLA) were up over 7% in pre-market trading after the company announced robust Q1 production numbers. According to company CEO Elon Musk, Tesla is now averaging production of over 2,000 electric vehicles a week and managed to produce 29,980 vehicles in the first quarter of 2018, proving that the company may be able to meet intense demand. This morning, Bitcoin is back above $7,400 as cryptocurrency markets attempt to recover. Bitcoin is trying to rebound from a brutal first quarter that saw the world's top cryptocurrency shed roughly $119 billion in market share. For more on where cryptocurrencies like Bitcoin are trading this morning, read our latest update here. The Spotify IPO will happen today, April 3, 2018. But investors are making a mistake if they are buying into this company. Instead, we have a better profit play for Money Morning readers. It's a proven winner that could climb 28% over the next 12 months, and that doesn't even include a $2.52 dividend (1.46%). If you're serious about making real money, read this. In deal news, CBS Corp. (NYSE: CBS) is reportedly looking at a possible all-cash bid to purchase rival Viacom Inc. (Nasdaq: VIAB). A potential deal would put the two media giants back under the same umbrella for the first time in more than a decade. Shares of Spotify Inc. (NYSE: SPOT) will be in focus today as the music-streaming giant goes public on Tuesday. The company has engaged in a very unorthodox IPO. It will not be raising any money on the public markets. Instead, it will simply be listing its stock on the New York Stock Exchange without the assistance of underwriters to determine a price or set demand. General Motors Inc. (NYSE: GM) will stop reporting monthly U.S. sales. The U.S. auto giant said in a statement that a one-month sales recollection does not accurately reflect the size and shape of the market. Instead, the firm will simply report quarterly sales moving forward. Rivals like Ford Motor Co. (NYSE: F) and Fiat Chrysler Automobiles NV (NYSE: FCAU) are likely to follow suit in the near future. Look for additional earnings reports from Dave & Buster's Entertainment (Nasdaq: PLAY), Jamba Inc. (Nasdaq: JMBA), International Speedway Corp. (Nasdaq: ISCA), AZZ Inc. (NYSE: AZZ), and Cloudera Inc. (Nasdaq: CLDR).